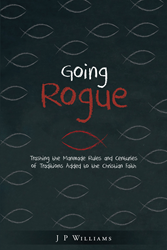 “Going Rogue: Trashing the Manmade Rules and Centuries of Traditions Added to the Christian Faith” from Christian Faith Publishing author J P Williams reveals what religious and other leaders have added to God’s commandments as part of an effort to enslave the faithful. “Going Rogue: Trashing the Manmade Rules and Centuries of Traditions Added to the Christian Faith” calls on the faithful to free themselves with God’s truth. “Going Rogue: Trashing the Manmade Rules and Centuries of Traditions Added to the Christian Faith”: a call to return to the original commandments and God’s truth. “Going Rogue: Trashing the Manmade Rules and Centuries of Traditions Added to the Christian Faith” is the creation of published author, J P Williams. Published by Christian Faith Publishing, J P Williams’s new book reveals the freedom of God’s commandments. The Ten Commandments and the 613 less famous commandments were given to Israel by God to ensure freedom and civility. The Scripture warns the faithful to never add or take away from those laws. By the time of Christ, however, the religious rulers had added hundreds, if not thousands of ordinances and distorted interpretations, which placed the Israelites under the control of the priests and the rule of Sanhedrin. These augmentations fueled conflict between Christ and the Pharisees. The Pharisees may have branded Christ a blasphemer for calling himself the Son of God, but it was also because he spoke out against their religious hierarchy. Today, there is “freedom of religion.” It is the result of the current dogma and traditions that were added to force denominations to compete against each other. It is a means to reign in their congregations, so they live life the way the church desires. Many of the faithful have simply traded the shackles of faithlessness with the shackles of the church instead of living by God’s truth. View a synopsis of “Going Rogue: Trashing the Manmade Rules and Centuries of Traditions Added to the Christian Faith” on YouTube. Consumers can purchase “Going Rogue: Trashing the Manmade Rules and Centuries of Traditions Added to the Christian Faith” at traditional brick & mortar bookstores, or online at Amazon.com, Apple iTunes store, Kobo or Barnes and Noble. For additional information or inquiries about “Going Rogue: Trashing the Manmade Rules and Centuries of Traditions Added to the Christian Faith,” contact the Christian Faith Publishing media department at 866-554-0919.